More photos: of the entire model and closer views. Click on the photos for high resolution pictures! By the end of the 17th century the fluyt DERFFLINGER belonged to the fleet of Kurfuerstentum Brandenburg. In the "triangle trade" of that time she transported rum and other stuff to Africa, to buy slaves, who were then exchanged in the West Indies for sugar, which was then brought to Europe. 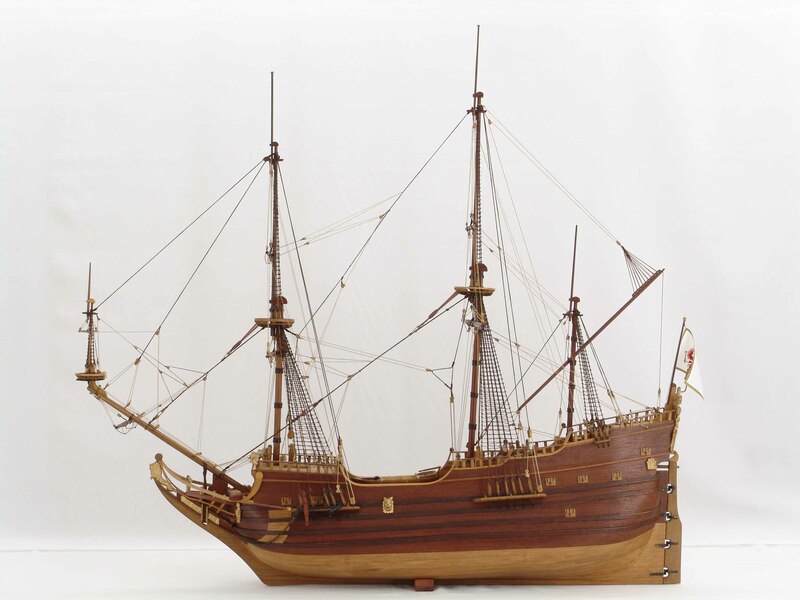 Later she and other Brandenburg ships were used in the War of the Spanish Succession. The ship was named in honour of cavalry general Georg von Derfflinger, who 1675 won a Brandenburg victory in the battle of Fehrbellin against the Swedish. He is depicted on the stern of the ship. The flag at the stern shows the Kurbrandenburg red eagle with hat, scepter, sword and breast shield. This excellent model of the DERFFLINGER is a eye-catcher for any exhibition. The somewhat peculiar hull form of the fluyts with strongly inward rounded frames and the round stern is clearly shown in the ship model. There are two stands the model could be put in. One is shown in the photo above, the ship model being stabilized by two small wedges in the middle of the hull. The other one is a somewhat bigger massive stand, putting the model some cm above the ground. See the comparison the two stands. This very beautiful, precisely built ship model is 1 : 60 scale. Length is 83 cm, width 32 cm, height 76 cm with the small wedges as stand and 81 cm with the massive stand. A set of photos: there are several views of the entire model and several closer views of hull and rigging. Click images to enlarge!